Day 2 : Amman– Amman City Tour –Desert Castles– Amman. After breakfast, tour of the old city of Amman exploring the Citadel and the Roman Theater, two of the most popular archaeological sites in the city. Head east into the desert and visit some of Jordan’s Desert Castles. They are beautiful examples of early Islamic art and architecture, with fine mosaics and fresco. See the stunning artwork in the UNESCO World Heritage Site of Qasr Amra. 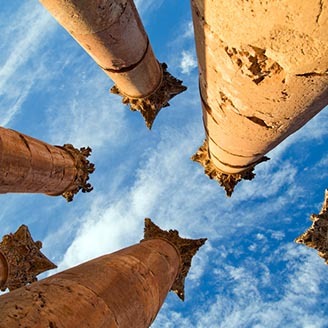 After breakfast, proceed to the north for full day tour visiting Jerash; the best-preserved city of the Roman times; theaters, temples, and colonnaded street. Proceed to Ajloun visiting Al-Rabid Castle; the 12th century Castle built by one of Saladin’s lieutenants in the campaign against the Crusaders. Drive to Amman for overnight. 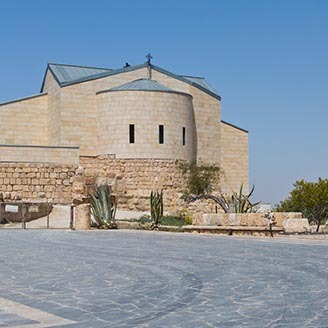 Day 4 : Amman- Madaba –Mt. Nebo –Kerak - Shobak –Petra. Breakfast at hotel, drive to Mount Nebo and wonder at the view where Moses looked across to the Promised Land and later died and was buried. Then on to the town of Madaba and discover the amazing Byzantine mosaics excavated from throughout the town. See the ‘Madaba Map’, the oldest preserved mosaic map of the Holy Lands . Day 5: Petra – Petra visit – Petra. After breakfast, visit Petra the home of the Nabataea’s; the complete city carved in a mountain with the huge colorful rocks that called “the red rose city”. The tour will start by crossing the “siq” lined with mountains in multiple colors up to the treasury; the pride of all Jordanian, The royal tomb, theater, the high place of sacrifice and roman soldier tombs. Breakfast at the hotel, free morning in Petra, and then visit Little Petra an old village located at the suburbs of the Nabatean capital. This village is completely excavated in the rocks and, in the Nabatean period, it was used as a deposit for their caravans. Drive to the desert of Wadi Rum. Overnight under private Bedouin tent..
After breakfast, drive to Aqaba. Spend the rest of the day relaxing , either exploring the markets of the downtown or visiting one of the beach resorts to swim, snorkel or scuba dive to admire the world-renowned multi-coloured coral reefs, fish and wildlife under the clear blue water. Day 9 : Aqaba – Baptism site -Dead Sea. After breakfast, transfer to The Baptism site around the Jordan River where Jesus baptized. Then drive to your hotel at Dead Sea. 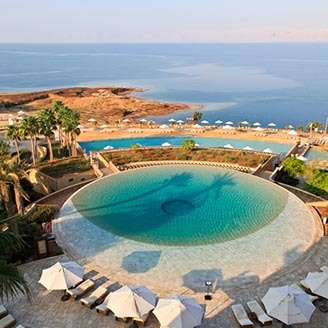 A free time at Dead Sea till you transferred to Queen Alia Airport for departure. 8 nights’ accommodation includes bed and breakfast sharing twin or triple standard room. (Single supplement applies if you want a single room). 1 night accommodation at Bedouin tent in Wadi rum includes dinner and breakfast sharing twin or triple standard room. (Single supplement applies if you want a single room). 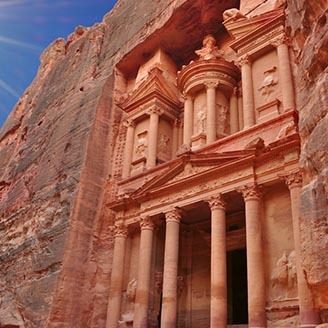 English speaking local guide in Petra for 2 – 3 hours for individuals (1- 4) persons. English speaking local guide in Jerash for 1 hour for individuals (1- 4) persons. Jordan collective visa for groups 5 persons and more (full passport details must receive prior arrival).